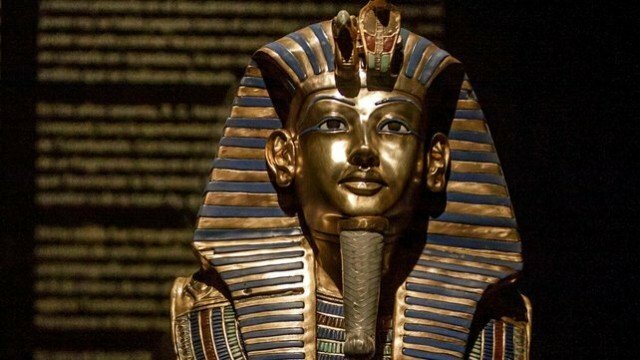 Tutankhamun’s blue and gold braided beard on the burial mask of the pharaoh was stuck on with epoxy after it was knocked during cleaning, say staff at Cairo museum. However, conservators at the Egypt museum in Cairo gave differing accounts of the exact circumstances. It is not clear whether the mask was damaged during cleaning or if the beard was removed because it was loose. The 3,000-year-old artefact, with other relics from the boy king’s tomb, is among Cairo’s biggest attractions. An inquiry is under way into what happened to one of Egypt’s greatest treasures. Instead of being taken to a conservation lab, the repair was performed quickly to put the mask back on display, conservators say. One of the museum conservators said quick-drying glue was used to re-attach the beard to the famed mask. A second one who was present at the time of the repair said the glue had dried on the mask and that a colleague used a spatula to remove it, leaving scratches. The director of the Egypt Museum, Mahmoud Al Hawagi, confirmed that a translucent adhesive material had appeared on the burial mask. The ministry of antiquities was now investigating how this happened, he added. The conservators spoke on condition of anonymity, but they agreed that orders for a quick fix must have come from above. The Egypt Museum is among Cairo’s top tourist sites, but in some areas ancient artefacts lie unprotected from the public. Tutankhamun’s burial mask was discovered in 1922 along with the pharaoh’s nearly intact tomb and sparked worldwide interest in archaeology and ancient Egypt.